One threatened Williamsburg Loft in a bulding the owner claims is too dangerous to allow for residential occupancy. One can only wonder why this owner allowed his agent (the overtenant) to give the entire flat a cosmetic facelift just prior to passage of the 2010 Loft Law. Indeed, this owner, upon visiting this unit as painters were busy painting engaged in cordial conversation with the prime lessee of the unit and seemed quite happy with the work being performed. A New York City Loft Tenant at the Upstate/Downstate Alliance protest in Albany this past January. 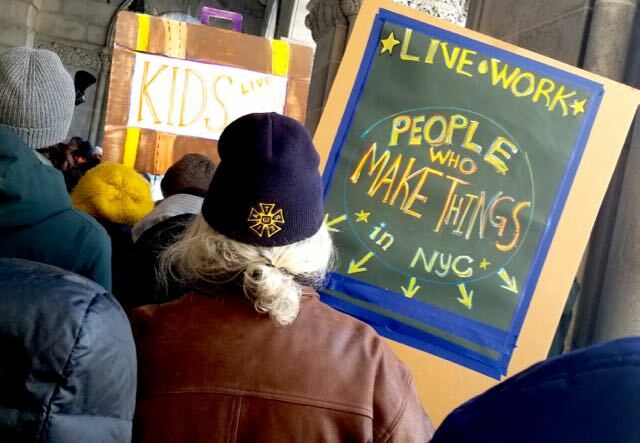 Anecdotally speaking, NYC lofts are disproprtionately populated by people who make things: Artists, craftspeople, freelancers, film crew and many other manner of creator. White Glass on Black / One if by Land (if too by Sea) / Where has all the Color Gone? Worldzight :: Loft Project NYC is currently putting together a list of first principles with respect to how citizens might better engage with the political process, especially on the local level, in the 21st century Information Age. We would love your input and insights. Beyond that here are a few first steps as we ourselves figure things out on a more granular level. Come to PARTY FOR THE PEOPLE on December 3, 2018 (6:30pm – 11pm) at Von Bar in Manhattan (3 Bleecker St., 10012). Tour our still in-development website. Today it’s the NYC Loft Board in need of citizen oversight. Who knows what tomorrow may bring our way? A great place to start would be by taking a gander at the LOFT PROJECT: EYES ON NYC and the ABOUT WORLDZIGHT pages on this website. Let us know what you think. CONTACT US if you would like to be added to our mailing list. While you are at it tell us a little bit about yourself and why you thought to contact us.